He, J, Kunze, K, Lofi, C, Madria, S, & Sigg, S. (2014). 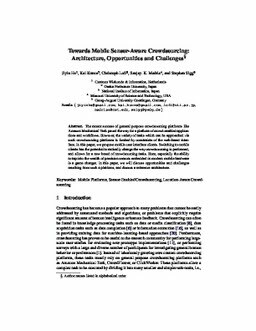 Towards Mobile Sensor-Aware Crowdsourcing: Architecture, Opportunities and Challenges. In Proceedings of DASFAA 2014 Workshop on Uncertain and Crowdsourced Data . Springer.